As a grandmother and longtime teacher of young children, I'm delighted to share my enthusiasm for A Day with Yayah, a 2018 Crocodile Books release by award-winning author Nicola I. Campbell (Interior Salish), illustrated by another award-winner, Julie Flett (Cree-Metis). 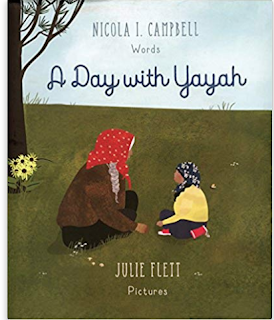 A Day with Yayah is a visual feast for fans of Julie Flett’s art, which just seems to get more amazing all the time. Start with the cover, where a little girl in a yellow sweater gazes into the face of a silver-haired woman. Both are seated on the ground and surrounded by dark green grass, scattered flowers, and light blue sky. Move to the endpapers with their seemingly simple, graceful plants and insects. One more page-turn and there’s a bright yellow warbler-type bird perched atop some tiny white flowers. On the facing page, the bird flies past the title. Turn the page again and it sits above the dedications. The facing page features another Indigenous child wearing red boots and a baseball-type cap, holding a yellow flower. One more page turn, and Nicola Campbell’s story begins as the little yellow bird looks on. It’s springtime, and Nikki and her grandmother ("Yayah" in their Indigenous language) are tanning a hide. (They’re the pair on the cover.) Along come two kids from next door, eager for their lessons from Yayah. She has been teaching them to identify edible wild plants AND to speak their Indigenous language, Nłeʔkepmxcin. She’s about to go gathering, and the kids want to go along. Yayah packs them a lunch, phones their families, and soon they’re all piled into Auntie Karen’s red minivan along with some other family members -- heading for a place where many significant plants can be found. Flett’s illustrations show readers what a beautiful day it is, and Campbell has Yayah teach the children “beautiful” in their language. Yayah talks with them about specific plants – how they grow, their uses, and what to avoid (like poison ivy). She uses the English names, but also tells them what those things are called “in our language,” and helps them with their pronunciation (for example, one sound “is made at the back of your throat”). Campbell weaves this vocabulary into the story multiple times, and many of the words are also set apart from the main text on the pages where they first appear, so child readers who are learning the language have several chances to practice each one. The story ends as the sun begins to go down, and the children give the food they have gathered to their elders. On the next page is Campbell's author’s note about Nłeʔkepmxcin, which is spoken by the Interior Salish people of what is currently known as British Columbia. I can’t make the proper spellings of the words because my keyboard lacks a lot of the characters. Facing the author’s note is a glossary/pronunciation guide to the words Yayah teaches in the story. On the final page before the end papers, that little yellow bird is back on the white flowers. This is probably the most beautiful “didactic” book I’ve ever encountered. Yes, it's meant for teaching, but it also conveys a particular way of teaching and learning -- grounded in solid, caring Indigenous family/community relationships, and in profound respect for children's need to interact closely with things that are worth investigating in their world. I think children will relate well to the characters' curiosity and eagerness to find out more about words and about the natural world. There's even some humor to further enrich the book-sharing experience. Speakers of Nłeʔkepmxcin reading today's post -- can you recommend a good resource for non-Salish adults who want to read aloud using the Nłeʔkepmxcin words in A Day with Yayah? The glossary and Campbell's in-text clues are extremely helpful, but some teachers may still hesitate to share it because of concern that they will mispronounce. 3) curiosity ("Wonder how I can find out more about it? Wonder what it would feel like to know what people are saying in that language?"). So far I haven't found recorded read-alouds of this book online. We can hope there will be some good ones soon! Campbell has Yayah and the children thank the Creator for what they find. This seems to be done in a general way, perhaps a bit like saying grace before a meal, and does not appear to involve ceremonial matters that shouldn't be shared outside their Indigenous community. In her dedication, Nicola Campbell honors Auntie "E.I." Ethel Isaacs for "our childhood memories of traditional food gathering." She also thanks a woman who has been a champion for preservation of Nłeʔkepmxcin. A Day with Yayah has all the features of an #ownvoices effort, and it’s strongly recommended. Jill Lepore's These Truths: A History of the United States came out this year (2018). Published by W. W. Norton and Company, teachers will be drawn to it as a source for developing lesson plans. As regular readers of American Indians in Children's Literature know, I will occasionally take a look at books marketed to adults because I think teachers might use them. I cannot recommend Lepore's book. In 1540, a young nobleman named Francisco Vásquez de Coronado led an army of Spaniards who were crossing the continent in search of a fabled city of gold. In what is now New Mexico, they found a hive on baked-clay apartment houses, the kind of town the Spanish took to calling a pueblo. Dutifully, Coronado had the Requerimiento read aloud. The Zuni listened to a man speaking a language they could not possibly understand. "They wore coats of iron, and warbonnets of metal, and carried for weapons short canes that spit fire and made thunder," the Zuni later said about Coronado's men. Some people use "hive" to characterize a state of activity but Lepore uses it to refer to the construction style of Native homes. Others have done it, too. For many (most?) people, it might seem fine, but to me--someone whose ancestors built those kinds of homes--I think the association of work with bees rather than human beings is a problem. For hundreds of years, white people have written about Native people in ways that overtly and subtly denigrate us, casting us as inferior. We were not, and it is wrong that such words continue to be used. Then, this acclaimed historian uses a problematic quote! 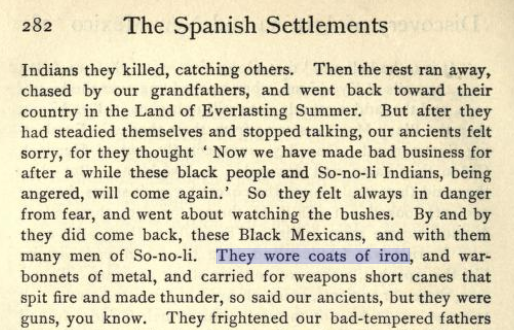 Let's take a close look at "They wore coats of iron..."
Lepore cites David Weber's The Spanish Frontier in North America for that quote. I looked at his book. 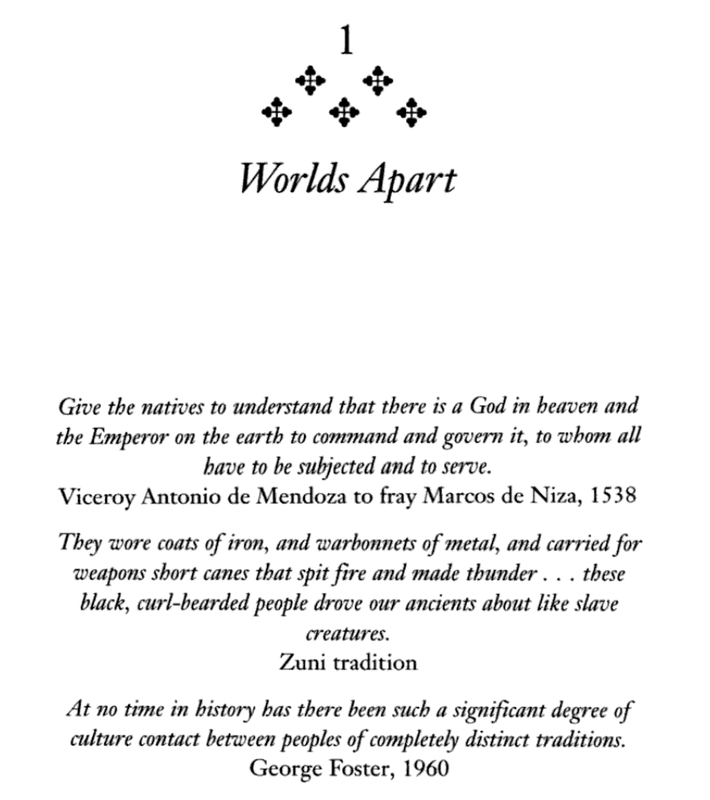 He has it as an epigraph for chapter one, and cites "Zuni tradition" (see the screen cap to the right). Lepore is a professor, teaching students how to become historians. When I was a professor in American Indian Studies, it was important to me that students learn that they must be critical of sources they used in their studies. Presumably, Lepore saw Weber's source when she chose to use it for her book. Did she think "Zuni tradition" was sufficient? Apparently, she did. Lowery failed in using Cushing as a source. Weber failed in using Lowery as a source. And Jill Lepore failed in using Weber as a source. I'm spelling that out--in that way--because it is important that teachers and professors take care in the sources they use then writing or teaching students. It is important to see how errors get recycled. And, it is especially troubling to see Lepore replicating this error, in 2018! Integrity of research is important. She's definitely failed in her passages about Zuni. It makes me wonder about the rest of the content. It should make you wary, too. On Twitter, I've seen several historians raise similar questions about her book. I'll write to them and ask if I can add their remarks here. 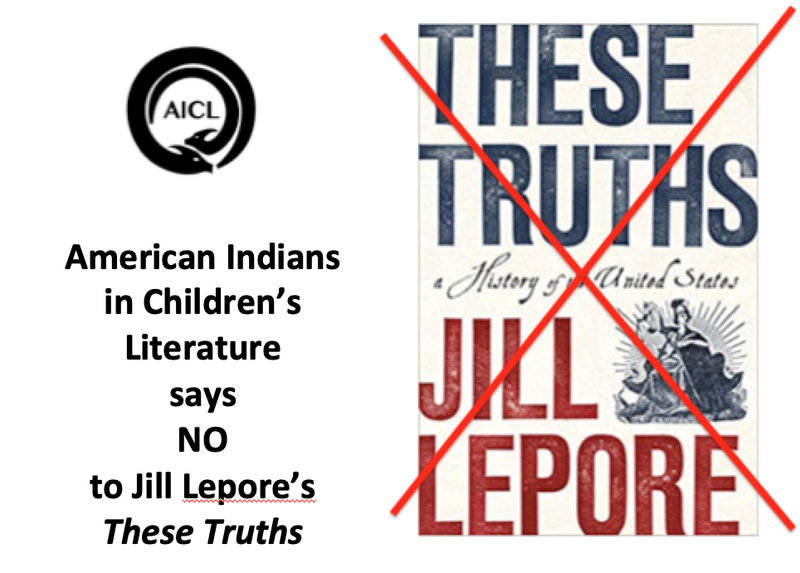 If you've read the book and see problems with how Lepore has represented Indigenous history and people, let me know. I'll add your comments to this post. Jackson's first campaign involved implementing the policy of Indian removal, forcibly moving native peoples east of the Mississippi River to lands to the west. This policy applied only to the South. There were Indian communities in the North--the Mashpees of Massachusetts, for instance--but their numbers were small. James Fennimore [sic] Cooper's The Last of the Mohicans (1826) was just one in a glut of romantic paeans to the "vanishing Indian," the ghost of Indians past. "We hear the rustling of their footsteps, like that of the withered leaves of autumn, and they are gone forever," wrote Justice Story in 1828. Jackson directed his policy of Indian removal at the much bigger communities of native peoples of the Southeast, the Cherokees, Chickasaws, Chocktaws [sic], Creeks, and Seminoles who lived on the homelands in Alabama, Florida, Georgia, Louisiana, Mississippi, and Tennessee, Jackson's home state. Since you asked...this is egregious. On so many levels. Any scholar of American Indian history could write an essay about the numerous problems with this passage. Because it’s 2018 and we all know that this is a tired, debunked narrative. 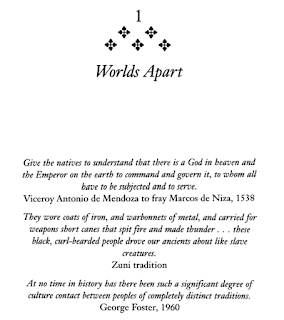 Folks who are curious about this need look no further than John Bowes 2016 book _Land Too Good for Indians: Northern Indian Removal_ The book has been widely reviewed, so it’s well known (or should be) among historians. 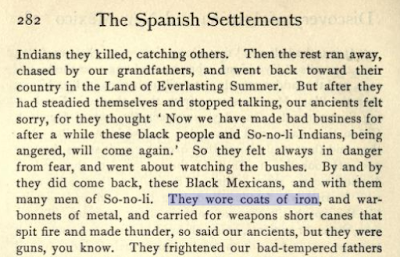 Thinking further about the seriousness of the problem, beyond its disconnection from current scholarship, I worry that a passage like this reinforces all the negative stereotypes about History and historians that circulate in Indian Country. And I think about the role that passages like this play in discouraging Native youth from studying History, because the stories they know about themselves, their families, their communities & their nations are misrepresented in narratives like this. And as a Native person who is a professional historian, I know that this sort of discouragement comes early and often, it can contribute to unwelcoming classroom environments, and it may be part of the reason there are so few Native people who hold PhDs and teach History. Happily, though, there are ways to address this. Together w my co-authors, we developed a larger discussion of *both* the problems and the solutions in our article “Materials and Methods in Native American and Indigenous Studies: Completing the Turn”. Dr. Mt. Pleasant recommended this post as part of this conversation: The Miseducation of the Public and the Erasure of Native Americans, written by Lewis Borck and Ashleigh Thompson, was posted on Nov 22, 2018 at the American Anthropological Association's blog. 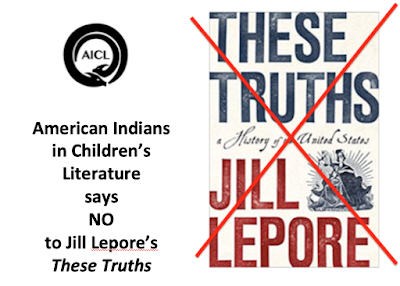 "delving into a specific example of how and why Jill Lepore's treatment of Indigenous histories--and the methods she employs--are so problematic. Uncritical use of colonialist sources that purport to speak for Indigenous people is a deeply rooted issue in Euro-American scholarship." See Dr. DeLucia's review of Lepore's book. It is at the Los Angeles Review of Books.